Welcome to the 'Waikiki Moon' at the Waikiki Banyan! Enjoy romantic Waikiki from this Tower 1, 29th floor upgraded and tastefully decorated and renovated condo with breathtaking views of Diamond Head, the turquoise waters of Waikiki, and the verdant green of Kapiolani Park. Located one block from world famous Waikiki surfing Beach. Beautifully decorated with walnut floors, granite kitchen countertops, stainless steel kitchen appliances and ceiling and floor crown molding. You are on the quieter side of the building, but one block from the beach and close to all the activities and excitement of Waikiki. Large flat screen TV in living room and small flat screen in bedroom . The Waikiki Banyan has a large recreation deck complete with swimming pool, 2 jacuzzi, tennis and basketball court, putting green, children's play center, and barbecue and picnic areas. Free parking for 1 car with in and out of privileges. Free high speed internet. Bring your laptop or notebook. I am a retired physician. My hobby is designing and decorating exciting vacation homes for travelers. My husband David loves to fix things, paint, and make my designs real. 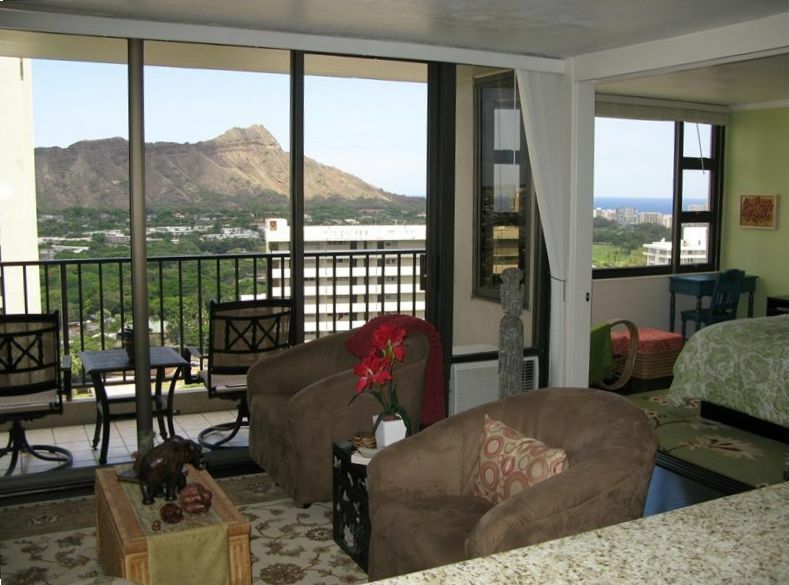 Terrific ocean view, Diamond Head view, a block from the beach, tastefully furnished, FREE PARKING! Quiet part of Waikiki. Near the best surfing. One block from ocean and beach. Surfing. coin operated washer and dryer on each floor of the condo. $1.50 each. Large Granite top kitchen island with 4 stools. Child&apos;s high chair and Pak N Play crib available upon request for fee. Large flat screen in living room. Small flat screen in bedroom. Basketball for 6th floor court. The Ala Wai Golf Course is within walking distance. Expansive Recreation Deck. Includes large swimming pool, 2 jacuzzi, tennis court, basketball court, putting green, children's play center, BBQ grills and picnic area No phone in the unit (most people carry cell phones nowadays or can Skype with a computer). Payphones are available in the lobby and on the 6th floor recreation level near the T1 elevator. We stayed at this condo two years ago. And we are back again. Everything does not change. A 7 day stay was pleasant. This condo will be our lodging. We will return here again in the near future. View and location were fantastic. The condo was well stocked as we made breakfast and some dinners. WiFi was fast and having 2 tv’s was nice. Having parking included was a huge bonus in not having to pay for parking. Elevators were fast and the kids made use of the pool. The owners were very helpful as well! Tasteful decor. Brathtaking view. Walking distance to beach, stores and restaurants. Nice, comfortable stay for our family of 4. Appartment is nicely furnished and decorated. Has a very island feel to it. Walking distance to beach. Beach chairs, floats and brand new body boards were available for use. Communal pool, jacusi, sauna and bbq pits were also visited during our stay. Be sure to be first on the bbq as the grill gets greasy from other users very quickly. It gets cleaned daily in the morning by Banyan staff. Pool was crowded but the water was warm. Dolly and David, the hosts, were out of country during our stay, but still were able to respond to few inquiries we had during our stay. Thank you David and Dolly for nice relaxing vacation. This place is awesome. The owners are truly great people. We enjoyed five nights in this neat and tidy condo. The view of Diamond Head each day was a special treat. And the convenience to the beach, and restaurants was appreciated. Only grump, and not a reflection of the condo, was the large number of kids and families using the Waikiki Banyan pool. One should peek over the railing, and pick a less popular time to enjoy the pool. We wondered how many of the kids were truly guests staying at the Banyan. There was no monitoring of the pool usage. Condo was very nice and close to terrific beaches. Cancellation policy: if owners are able to rebook same days, guest will get a refund minus $75 administration fee. There will be a fee for revision of rental agreement. Discount for monthly rental. Discount for a week or more. Our unit is privately owned and managed by us. Hotel concierge, front desk and poolside towels are not part of what we provide. There is no daily maid service.